In Tinderbox outlines, prototypes are distinguished by a subtle green halo surrounding the note icon. 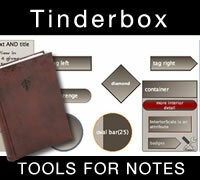 Tinderbox prototypes are notes that also serve as examples on which other notes may be based. Some notes describe sources, such as books on digital photography. These notes have Key Attributes like Author and Title and URL. Perhaps we'll also want to make all these notes small and blue, so they stand out from the crowd. Some notes describe features that distinguish cameras, or criteria that we might need to consider when choosing a camera for a different task. Other notes describe specific cameras. These notes might have Key Attributes like Price, Manufacturer, and Model Number. Again, a distinctive color or shape might make these notes easy to locate amid a sea of features and sources. At times, we can foresee that a particular prototype will be useful for a project. Creating prototypes in advance is a form of Preparing the Page. At other times, you may discover the need for a prototype only after you create several different notes and realize they share some properties. Gradual discovery of structure is sometimes called incremental formalization.